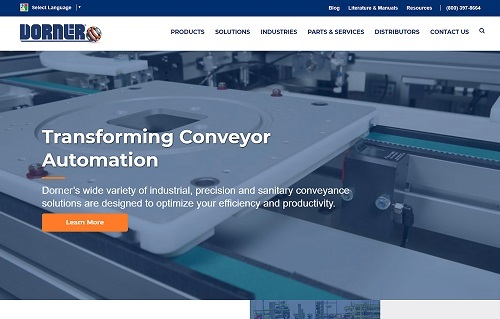 Dornerâ€™s new website features a professional, responsive design, placing the world of conveyor systems at the fingertips of users on the go. Dornerâ€™s newly revamped website features a more modern, user-friendly interface for better functionality and customer support. Customers will find the site even easier to use and navigate, and the site is fully responsive, making it the go-to conveyor resource for people working from their mobile devices. Dorner's AquaGard line of sanitary conveyors are designed for wipe down and light washdown applications. Our new AquaGard 7200, 7300, 7350 & 7360 Series Brochure is now available for download or order on Dorner's Literature Page. We have a couple trade shows coming up in early 2018. We will also be exhibiting at PMMI's PACK EXPO East in Philadelphia, PA.
Stop by Booth 924 from April 16-18, 2018 to see some of our newest packaging technologies. Dorner will be closed for Christmas on December 25 & 26, 2017. Dorner will also be closed for New Year's from December 29, 2017 - January 1, 2018. We will be open on December 27 & 28, 2017. It's been a great year at Dorner and we appreciate everyone who has chosen Dorner as their trusted conveyor provider. Have a wonderful holiday season and happy New Year's!